Presented in 2D on our 4K IMAX with Laser projection system featuring IMAX’s next-generation, enhanced 12-channel system with 114 speakers capable of 52,000 watts of digital sound and a six-story-high screen offering a truly immersive experience. The crystal-clear images, coupled with IMAX’s customized theater geometry and powerful digital audio, create a unique environment that will make audiences feel as if they are in the movie. FILM RATING: This film is rated PG. RUNNING TIME: 2 hours and 10 minutes including trailers. “Tim Burton makes Disney’s elephant fly again.” – Johnny Oleksinski, New York Post. “Dumbo” is a visually sumptuous effort with wondrous sights…” Brian Truitt, USA Today. “Dumbo is another visual treat from Burton, with wit and emotion to boot.” – Ben Travis, Empire Magazine. 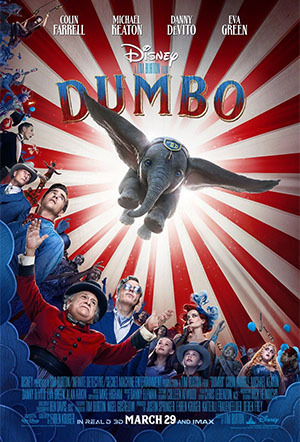 “Dumbo is Burton’s best live-action in awhile, dark, funny, and family friendly with the same lovable baby elephant you’ll find yourself cheering on.” Jo-Anne Rowney, Daily Mirror (UK). “Tim Burton makes his mark on live-action ‘Dumbo’ – Stephen Schaefer, Boston Herald.